Peace of Mind is the result when we soundproof your home or business - - the peace of mind that comes from knowing that you can't hear the neighbors, and that THEY can't hear you! Make your home or office a stress-free zone by eliminating the NOISE; traffic, barking dogs, footsteps, loud music, raised voices, even mechanical systems like boilers, generators, heaters, plumbing, or AC units. These are the sounds of modern living. Let us mitigate their effect on your ability to enjoy your home, or to run your business. 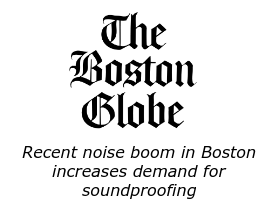 New England Soundproofing has many years of experience quieting the New England Area! Peace & Quiet is a precious commodity, and one that New England Soundproofing can deliver with precision. New England Soundproofing furnishes on-site sound testing in order to accurately assess how sound is behaving in your space. We have cutting edge technical solutions for every noise problem, residential or commercial, and for every type of structure. Whether you want to keep the noise in, out, or both, call the noise pollution experts to get the perfect solution. Whether we install or you do, we work with owners, contractors and property managers to find the best, most cost-effective noise abatement solution. YOU DON’T HAVE TO LIVE WITH THE NOISE! On-Site Sound Testing is a scientific method we use to measure how sound is behaving in your space, enabling us to determine the best soundproofing solution. Municipal Noise Laws. Have you received a noise complaint? Complying with local ordinances will keep you out of court and protect your peace of mind. Acoustical Panels. We provide Services to reduce reverberation or echo within public or private spaces. We manufacture our own brand of custom-made Acoustical Panels. Restaurant Soundproofing. Background noise is a common complaint for restaurants. Soundproofing will reduce reverberation in your restaurant, for a more pleasant dining experience. Wall Soundproofing is highly effective and easier than you may think, as there are many levels of intervention possible. It's not too late to soundproof your walls. Ceiling and Floor Soundproofing will reduce impact and airborne noise from your upstairs and downstairs neighbors. Door Soundproofing is easy to install and prevents noise from travelling between rooms or from the outside in. Condo/Apartment Soundproofing. We can block the sound of your noisy neighbors without you having to sacrifice space. We provide several options. Mechanical/HVAC Soundproofing. HVAC systems can produce noise in your living space. Depending on the type of system and its location, there are strategies for mitigating unwanted noise. Product Catalog. Looking for DIY soundproofing? Visit our online store to see what soundproofing products we carry. We can soundproof any home, office, mechanical room, or even marine structure, whether new construction or existing retrofit. The most efficient way to address sound transmission issues is during construction; however, we have aftermarket solutions that will reduce noise throughout your existing home or business. Whether it is during or after construction, we can successfully soundproof your home, office, or boat! Soundproofing is an exciting field because there are new acoustical treatment products and solutions coming out every month. See our Soundproofing Videos to see how well our products work! We have soundproofed condos, rental units, offices, music studios, bars and restaurants all across New England. With hundreds of satisfied customers, New England Soundproofing is the only place to get your soundproofing products, along with access to FULL professional installations! Please call 781-710-1261 and tell us about your least favorite noise! Now get soundproofing products sent right to your home or business! Order online at NESoundStore.com, open 24 hours a day! NESoundStore.com provides excellent soundproofing and acoustic products delivered to your door. Any contractor or hands-on homeowner can install this easy-to-use soundproofing material. New England Soundproofing will ship you not only the product, but installation instructions for the product, and we offer support if you have any questions, at (781) 710-1261!